Loved the location and staff! Older rooms but clean hot water was the only issue when they were a full house but definitely would stay again!! Excellent location to shopping and dining. Front desk staff was very unpleasant. Disappointed that the hot tub and pool were out of service. One of the beds had stains, hair, and crumbs as if sheets hadn't been changed. Overall though the room wasn't bad. Location, is great you can walk on Main St and find a variety of places where to eat. Very clean hotel. The room was old and in desperate need of renovation. Broken front door lock, missing chain, not latching doors, wall and floor cracks everywhere in the bathroom (probably due to building settling), broken hangers. TV was modern. The rest reminded of the early 1990s. Loved it. But the ice machine is outside, it was windy and I found dust blown into it. Nice location. Shower is great. The room is very spacious. The only downside is that the AC is a bit loud. Decent value given the budget price. Rooms are renovated, but mine still had issues. The faucet handle was loose. They don't provide lotion. Most annoying, the bathroom layout is odd. They have two large windows in the bathroom and toilet areas that let a lot of light into the room. Not good if you want to sleep in with a blackout room. Both my keys got deactivated after a maid visit. The front desk issued me new keys without even checking who I was or asking for ID. Not good security practice. Very close to the Archer Park, good staff, clean and spacious. No breakfast. A little ecpensive. The hotel was clean and comfortable. The staff was polite and efficient. My only complaint was that I was not able to turn off the air conditioner, and it was loud. Close to downtown and touristy areas such as Arches National Park. A/C was working, has fridge, comfortable beds. They give discount for the restaurant nextdoor called Pancake Haus. Hotel is within walking distance to all the shops in downtown and lots of restaurants. Pleasantlily surprised. We did not expect much. The rooms are in better shape then what the outside projects. Location is right in the center of town. I was pleased when we walked into our room. The balcony was a big plus ! Located within a 5-minute walk of Moab Information Center, Hotel Moab Downtown is within a 15-minute stroll of Museum of Moab. This motel has 81 rooms and welcomes guests with conveniences like a restaurant, an outdoor pool, and free in-room WiFi. Enjoy a bite to eat at Pancake Haus, the motel's onsite restaurant. For your convenience, a cooked-to-order breakfast is served for a fee each morning from 6:30 AM to 1 PM. 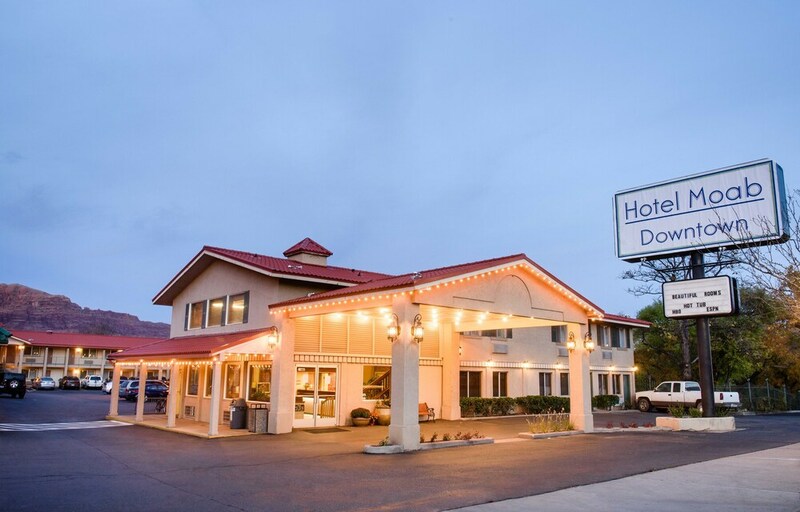 Hotel Moab Downtown offers an outdoor pool, a spa tub, and free WiFi in public areas. You can put free parking to good use if you drive. The 24-hour front desk has multilingual staff ready to assist with luggage storage and securing valuables. Additional amenities include conference space, a business center, and free newspapers. Cooked-to-order breakfast is served daily from 6:30 AM to 1 PM for a fee. The motel has an outdoor pool and a spa tub. The preferred airport is Moab, UT (CNY-Canyonlands Field): 21-min drive, 18.4 mi/29.6 km.